From left: Skylar Crawford and Aderes Law water hanging baskets that are for sale at the school’s greenhouse. 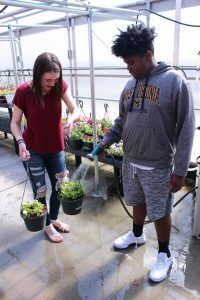 Students in the Sherrard Middle School Vocational Agriculture classes are preparing to sell hanging baskets, vegetable plants and a variety of flowers they grew in the school’s greenhouse. In late January students began germinating seeds for tomatoes, peppers and cabbage. Then at the end of February they purchased and transplanted plugs for various types of other flowers. Students ensured the proper temperature and humidity were maintained in the greenhouse and monitored the vegetation’s growth daily. All Hanging Baskets are $13. They make a perfect gift for Mother’s Day and supports the school’s Agriculture program. Flowers for sale include: Wave Petunias, Begonias, Snapdragons, Zinnias, Maiden Pinks, Impatiens, French Marigolds, Verbenas, Coleus, Geraniums, and Polka Dots. New this year, Pentas are available and are one of the best pollinator-attracting plants for butterflies, hummingbirds and bees. They are ready to be planted in bio-degradable individual containers for $2 each. Beginning Thursday, May 10, 2018 the Sherrard Middle School Greenhouse will be open for business every school day from 8:00 a.m. until 3:00 p.m. The public is invited to the sale, which will continue until everything is sold.